For example, Kelly Parker has created a non-profit called GOOD in DEED, in which everything you click on in their site gives back and makes a difference in some way, shape or form to so many people and changes their lives. A great friend and client of ours, Eldonna Lewis Fernandez, a retired USAF Master Sargent, now professional speaker, spends a great portion of her time traveling to Africa to help those in great need. Eldonna raises funds with Baskets and Beads handcrafted by Artisans in Kenya. The ladies of Kipsongo and Ladies of Kitale handcraft these beautiful items to support their families. “Welcome to the Baskets and Beads page. In Feb 2018 I went to Kitale, Kenya on a Mission Trip with Reaching Beyond Ourselves to serve and share my faith with the people of Kenya. I was there 10 days. One day, we went to the Kipsongo slum and I shared my story with the women there. I met many wonderful ladies who were making and selling hand crafted beaded items to help support themselves and their families. They had received micro loans to purchase the materials. I was awakened in the middle of the night after our day with them. I had a God inspired idea to go into business with the ladies I met in Kipsongo and other ladies I met in Kitale. My original idea was to offer the beads as part of a package with my books when I speak. I am doing that and also I have them in a couple of shops and more people are interested in purchasing their handcrafted items and supporting these women. Val and I recently found a great way to give to the elderly in need with the assistance of two of our amazing dogs, Gillie and Saoirse (pronounced sursha). At first, we weren’t sure if it was going to work or not. However, just the other day Val and I were just blessed with the opportunity to visit some elderly folks with Gillie and Saoirse, and I can’t express how rewarding and fulfilling it was. We initially approached some patients who were pretty apprehensive about being approached by our dogs, but on the back-swing they surprised us by wanting the dogs to cuddle with them. 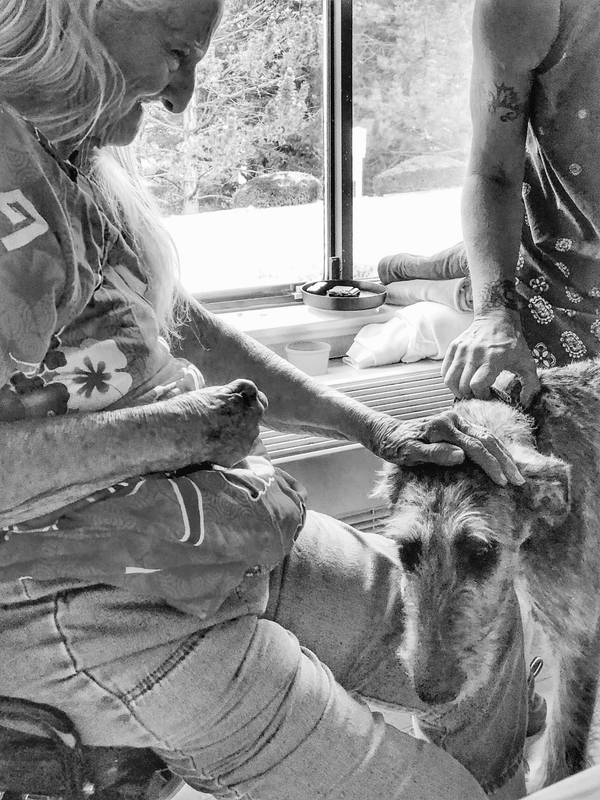 Seeing our dogs make someone in need happy gave us an experience that words can’t describe. A man without the ability to speak, carrying a dry-erase board, barefoot in a wheelchair, gave Val a fist-bump with tears streaming down his face while he was petting Gillie... and that’s all I have to say about that. We have found over the years that animals can have a huge impact on people. If you have a loving, well behaved pet that would like some free hugs, contact your local elderly assisted centers to find out what their requirements would be to do a “Gift Of Giving” visit. Check out this video of David Flood speaking to high school students about acts of kindness.